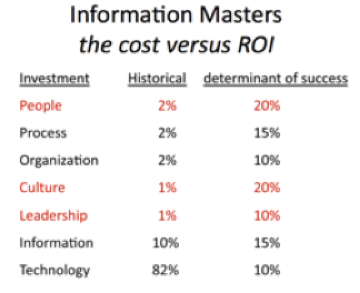 I came across an interesting chart today showing the ROI of investing in different areas of a business’s operations, it came from John McKean’s book “Information Masters”. Although I do not have the full context for the chart, my interpretation is that it shows the various levels of investment in the 7 “competencies” identified by John and the various levels of impact each have on a firm’s results. It confirms our own experience and research that show that small investments in skill development (People) and culture can yield substantial ROI for firms. 1. Employee skills to apply it. 2. Process by which to efficiently deploy it. 3. Organizational structure and rewards for effective use in and across functional areas. 4. Culture to perpetuate its use and appreciation of its value. 5. Leadership to fully understand and support its role and investment. This entry was posted in Business Intelligence, Customer Insight, market culture, Uncategorized and tagged linkedin; information to insight; customer data; roi. Bookmark the permalink.